What is involved in a ceremony? The beauty of a civil ceremony is that we don’t have to have anything religious – tick! But, if you’d like to include Corinthians for Nan, that is perfectly fine too. We also need to share the legal vows, which is a one liner. This doesn’t mean you can’t have your own personal vows as well, it will not detract from their sentiment. Again, we don’t have much flexibility with the one liner I'm sorry...but the rest of your vows can be amazing and totally your own words. The rest of the ceremony is built upon you as a couple – your story, your future, what marriage means to you, traditions and rituals. At our initial meeting, we’ll discuss all your different options and you can tell me what you do and don’t like. Your ceremony will be exactly how you like it – I’m not going to be offended if you edit something out. How are your ceremonies different? My ceremonies are different because I love to involve YOU! I love to have your guests engaged and not eyes glazing over like they’d rather be watching re runs of MASH. My ceremonies run smoothly, they have a great balance of legal requirement, tradition and your personal story. I love to have a laugh – with you, not at you. And you won’t find me making horrific jokes about the wedding night (we’ve all been to one of those ceremonies, right?!). My ceremonies are relaxed, light hearted but also convey the seriousness of getting married. I also make sure I’m not in the way of all your photos. I know I’m amazing, but I’m fairly certain 20 years down the track you don’t want to be looking at photos with me smack bang in the middle of your first kiss as husband and wife. I’ll also move at points during the ceremony so that your photographer can take a shot of the entire wedding squad without me in it. I am freaking out about writing vows – can you help? Sure can! I provide you with plenty of examples to get your thoughts started and even to choose a bit from here and bit from here. Plus the questionnaire that I give you to fill out as a couple will get you reminiscing and thinking about what it is you love about that person. Don’t stress if you aren’t a wordsmith – you don’t have to be! The best vows I’ve heard have been a jumble of thoughts and words of love and laughter. Enjoy the moment and speak from the heart. Do we do a rehearsal and why? Yes, I like to meet you both again either the day before, or the week or month before – whatever suits your schedule best. Now, when I say rehearsal, I don’t mean full blown we’re going to say everything in the ceremony. Nope. It is a quick run through of walking down the aisle, the hand over, how we’re going to stand, what happens at the vows and ring exchange, signing and celebrating at the end. It gives me the opportunity to visually take a snapshot of your ceremony site (particularly if I’ve never been there before) and it eases some anxiousness for you both (and your wedding squad!). We can also practice walking down the aisle to your chosen song. The rehearsal should take only 45 minutes. You can check out my terms and conditions here but basically my fee that I quote you will include all legals, performing your ceremony, travel, rehearsal, PA with microphone set up and songs downloaded on my iPhone for your ceremony. What do you mean by legal documents? The first document we need to complete is the Notice of Intended Marriage (NOIM). This document must be lodged with me at least one month prior to the wedding. Just as it’s called, the form sets out your intention to marry and provides me all the information that I need to complete your legal documents for your ceremony. With this document, I must sight proof of your birth, photo identification and if you’ve been married previously, proof that this marriage has ended. When we meet for the rehearsal we’ll complete a statutory declaration. This declaration must be signed prior to the ceremony commencing so if we don’t do a rehearsal I’ll make other arrangements to have this signed. This form declares that you are both able to be married and that you believe the other person can too. Once we’ve performed the ceremony, we’ll sign the official certificate of marriage, which with the NOIM will be lodged with the Registry of Births, Deaths and Marriages (BDM) in the state where you are married. Additionally, we’ll sign my register for my records and the ceremonial marriage certificate which you get to keep. Once your marriage is registered with BDM, you will receive your registered marriage certificate - this can be used to change your last name. Don’t celebrants only work for 20 minutes? Why is the fee so much? On average, I would spend about 20 hours – not 20 minutes – per wedding. If you consider that a BDM registry wedding is a minimum of $350 for only the legal details covered and you must go to them (sometimes in an outdated courthouse), then what I offer is fantastic value in comparison. I have been a celebrant for over seven years and have tried and tested quite a few set ups and I am now finally happy with what I have, so I warn you – I’m about to get geeky. My Phonic Safari PA packs a punch (100 watts) and runs on its own battery power. This means we can take it anywhere and the battery will last 8 hours while running. It also means that we can be on the beach and all your guests will hear it over waves crashing, jet skis, planes or anything else to impair hearing for your guests. Granddad certainly won’t need to bring his hearing aids to hear the ceremony. The other thing I love about my PA – it has Bluetooth functionality. So many other brands don’t have this option at all. It means I can play music from my iPad directly to my PA and stand anywhere at the ceremony site. No getting any guests to control it, and I don’t have to run from one spot to another getting in the way of guests, wedding squad or photographers. I use a handheld, wireless microphone for my ceremonies. I’m not a fan of the ‘Madonna’ microphones, and lapel microphones pick up way too much wind or clothing noise for my liking. 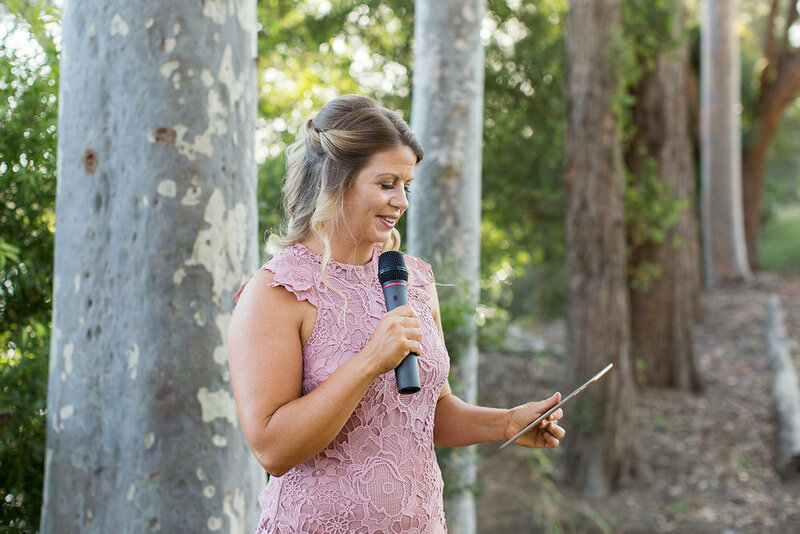 A handheld microphone is also quick and easy to hand over to any guests if there’s a reading within your ceremony. And finally, I love using an iPad to read the ceremony. I’ve done the folder and stand. It just doesn’t give me the freedom of an iPad. I know that my ceremony won’t get wet or flick pages due to the weather. I don’t need to use two hands to change the page. People don’t hear the rustling of pages when they’re turned. It is simple, it is efficient, looks professional and it works brilliantly. All over Australia! I love to travel, I love seeing our country and I am authorised to perform ceremonies anywhere in Australia. We can discuss options of costs and accommodation, particularly as I may want to add on my own personal travel with it. Generally, with locations more than 1.5 hours from my home address on the Sunshine Coast (round trip of 3 hours), I will charge more for travel and will need to consider accommodation. Please ask for a quote to consider. Do you take a tacky photo holding up the marriage certificate? Nope. No. Never. I much prefer a candid photo of us three smiling naturally. There will be no awkward ‘here’s your certificate’ photo. I give the certificate to a trusted guest after the ceremony so you’re not walking down the aisle with a certificate tucked under your arm.